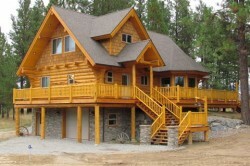 Based in Central Idaho, Clearwater Log Structures designs and builds custom handcrafted log homes with full scribe, Swedish cope, or chink style construction. We use dry, dead standing lodgepole pine logs – hand peeled with a drawknife to retain the protective insulating layer just under the bark and preserve each log’s natural color and character. A log home is defined by a passion for quality workmanship, and the desire for customer service that will exceed your expectations. Our homes are first constructed in our Clearwater Log Yard – then numbered, disassembled, and trucked to your site for final assembly. 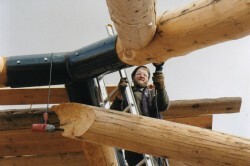 Watch videos outlining the stagesunder which Clearwater Log Structures operates. We would be honored to create your dream home. Contact us to discuss your vision, and receive a free quote.